kelbysews: Gifts, Quilting, and WOWZA! I'm meeting up with 8 of my favorite girls in Atlanta next week and I'm busy making some presents for them! I bought these wooden frames a while back (sorry, I don't remember where!) and I painted each one a different color using acrylic paint. Then, I cut a piece of fabric that is slightly larger than the frame and 3-4 pieces of batting a tiny bit larger than the frame opening. I'm sure you could use fiber-fill stuff too, but I have tons of batting scraps so that's what I used! Push the fabric with batting through the frame opening and place the cardboard frame backing in place. Pull the fabric taunt over the batting. Use hot glue to secure the excess down to the cardboard frame backing. I'm busy quilting my Scrappy Trip Along! I decided to use a cathedral-like quilting (see my video tutorial). This process is pretty speedy and it's super forgiving if you're new to free motion quilting! I finally broke down and sent out a quilt to be professionally quilted. I made this top using blocks from two of my quilting bees--see my post about it here I knew this top needed something special so I asked Krista to take care of my baby. I did not give her instructions. I simply trusted her. Obviously, she didn't disappoint! She totally blew me away with this "K" quilted into one of the blocks! Can you believe this???? It's absolutely stunning! Every square inch is covered in awesomeness!!! I truly cannot thank Krista enough for her fabulous artistic talents! This quilt is better than I could have ever dreamed! I even love it from the back! I'm waiting on my binding fabric to arrive to finish this up and I can't wait to snuggle under it! Great gifts for your friends. Enjoy yourself here in Atlanta. That Good Folks quilt is one of my favorites!!!! I love it - such a great example of how participating in bees can be worth it. That quilting is AMAZING too!!!!! It's truly amazing. Krista did a SMASH-BANG job, for sure! I'm drooling!! Your AMH quilt is Amazing!!!! Your post is chock full of goodness! Love that quilt and brilliant idea for quick & colorful pincushions. Love your quilt!!! It was fabulous prior to the quilting now it is stunning!!! That quilt is amazing! So beautiful! The top would be lovely by itself but the quilting just takes it to a whole new level. Gorgeous! Beautiful! I love that Field Study print on the back, that's one of my favorite prints ever! Sensational bee and quilting work. Yay!! Those frames are just too cute! can't wait to see you in a few days!! Eeep! I hope you are bringing the quilt so we can see Krista's awesomeness in person. Wish she was going to be there too. This is beyond awesome! I can't believe the awesomeness of this quilt! :) That quilting is over the top too! This post makes me so excited for Thursday!! You better be binding that quilt in Atlanta so we can all drool over it! Beautiful gifts for your friends, I love your idea for the pincushion, that's so cute! that quilt is absolutely fantastic! Lucky you! I've been trying to decide how to quilt my scrappy trip along, thank you for sharing the tip, I love the circles contrasting with the squares! the quilt looks so great! and I love how you're quilting the scrappy trip! super cute and perfect for all the squares! That quilt is BEAUTIFUL and awesome. 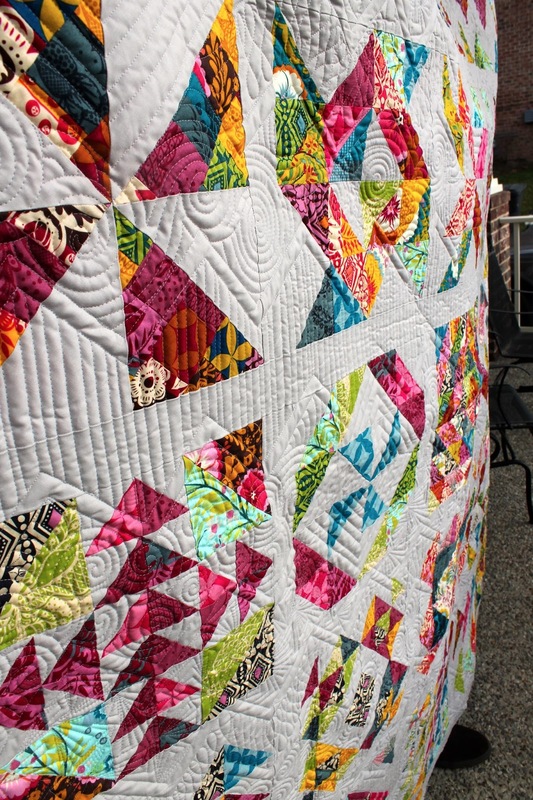 Those longarm quilters really can make a quilt come to life. Lucky you. This is just stunning, breathtaking, well, can't really think of adequate words!